Recover a ring stolen by a freelance thief. Ahdarji - An heirloom or something more precious? Travel to Leyawiin and speak with Ahdarji to get the details of the quest. Discover the whereabouts of Amusei and question him about the ring. Steal the ring from Countess Alessia Caro. Return the ring to Ahdarji for a reward, and report to S'Krivva for another reward. Go to your new Doyen, S'Krivva in Bravil, to receive this quest. 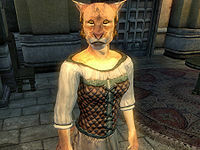 She will tell you that a ring has been stolen from a Khajiit and former Thieves Guild member named Ahdarji by someone not in the guild. Since the guild frowns on rogue or freelance thieves, they are willing to help Ahdarji; more precisely, they are willing to send you to help her. Speak to any beggar in Leyawiin and you will be told that Ahdarji lives on the west side of town (she actually lives on the east), goes to the Three Sisters' Inn in the evenings, and eats her midday meals at the Five Claws Lodge. Find her at one of those locations, and speak to her. Ahdarji tells you that an Argonian named Amusei (remember him?) stole the ring. She wants you to kill him and get her ring back. Of course, you can't kill him since he is essential until The Ultimate Heist is completed, so she says to at least make him suffer. Talk to a beggar to find out where Amusei is. Pay one of them and you learn that he was arrested for trying to swindle Alessia Caro, the Countess of Leyawiin. You also find out that the guards accept bribes to allow people to visit prisoners. Head to the castle dungeon and talk to the jailor. He tells you that "dirty lizards" aren't allowed to have visitors per the countess' orders; however, 20 gold quickly changes his tune. Picking the lock to the dungeon is also possible, though the lock is level-dependent. If you don't even want to do that, pickpocket the guard and steal his dungeon key. Go downstairs, and ask Amusei where the ring is. He questions why he should tell you. Bribe him with a lockpick, and he reveals that the ring didn't originally belong to Ahdarji, but rather to the countess. After stealing it from Ahdarji, he tried to ransom it back to her and was arrested. The ring is now in the hands of the countess. In order to avoid a possible future bug, you must then return to Ahdarji and tell her that Amusei tried to sell the ring back, she will say that she will make better use of the ring and will pay double for you to steal it back for her. If you talk to a beggar, he or she will tell you to talk to Hlidara Mothril, the countess' handmaiden, who stays with the countess all day. The beggar will also tell you about other "secrets" in the castle: a torture chamber specifically for Argonians. Oddly enough, you can get the tip about Hlidara Mothril from the Count himself, although he mentions nothing of the torture chamber. You can ask the countess about the ring, too, and she doesn't seem to get suspicious. With a disposition of 70, Hlidara Mothril tells you the countess wears the ring at all times except for baths and while she's sleeping, at which point it is left in a jewelry box. She will also tell you about a secret passage from the torture room to the countess' private quarters. The countess sleeps at 11pm and her jewelry box is to the right of her bed on the dresser. Wait until about 1am and proceed to the countess' private quarters. Head to the Castle Leyawiin Basement to find a lever hidden in an open barrel. Pull the lever and the wall will open up, revealing a passage to the secret torture room. There's a second lever you'll have to pull hidden in the secret passage. Pick the leveled lock on the next door (or steal the key from the count or Caelia Draconis beforehand), sneak left past the patrolling guard, and pick the lock on the leveled private chambers' door. You can also try reaching the Private Quarters via the County Hall itself, but you will have to avoid more denizens and guards that way. Once inside the countess' room, pick the leveled lock on the jewelry box or pickpocket the key from the countess, grab the ring and some minor treasure, including the letter called Divining the Elder Scolls (which is worth 50 gold), and go out the way you came in. Beware, the guard is still patrolling. Return to Ahdarji, and give her the ring for a 200 gold reward for your efforts (if you don't tell her Amusei tried to sell the ring, she only gives you 100 gold). Finally, return to S'Krivva for another 200 gold reward, rank advancement to Prowler, and your next mission. * These NPCs have nothing (at least almost nothing in Caelia Draconis' case) to do with the quest and are actually a target for assassination in another quest for another faction. As the countess' essential status is removed upon completion of this quest, it is highly recommended to complete Sanguine's Daedric quest before attempting this. However, completing the Sanguine quest beforehand can, in rare cases, trigger a minor bug. See the bugs section for details. An achievement will be unlocked upon being promoted to Prowler. If you choose to 'free' Amusei by unlocking his cell door, he will not move or run away. Furthermore, if you force him to run away (e.g. by casting a "Demoralise" spell) nobody will notice or try to stop him. If you unlock the door to the cell that Amusei occupies before the quest starts, you will find him sneaking around the hallway when the guard opens the door for you. If you ask about contracts from S'Krivva, and then decline to accept the contract at that time, it may become impossible to resume this quest. It is recommended that you not ask S'Krivva about the assignment until you are ready to accept it. You can correct it by entering the console command setstage TG04Mistake 10. This will update the quest, directing you to see Ahdarji. This quest cannot be completed while you have Sanguine as a current quest; however, even after completing Sanguine, the countess may permanently sit down at the dining room table instead of retiring to her bedroom like she should. You can use the console command player.additem 00035E95 1 to add the ring to your inventory and complete the quest. Otherwise, you can attack her. You will have to pay about 40 gold for the assault, but it will get her to get out of the chair and go about her normal routine. Going to jail will also solve this problem. Also, if you leave the castle, wait for a day, and then return, the countess may be found walking to her bedroom. Sibylla and Matthias Draconis share a script with Caelia that causes them to trigger the Blood Price even though they have nothing to do with the quest. If you enter the castle with this quest active while the countess is on her monthly trip to Chorrol (15th through 17th of every month), the countess may never place her ring in the jewelry box. This effectively ends your guild adventures. One solution is to talk to the countess and inquire where she keeps her ring. Then wait until she travels to Chorrol to visit her mother and then returns to the Leyawiin. She should now place her ring correctly in the box when she sleeps. Alternatively, you can simply reload the game and toggle to a different active quest. The ring should reappear in the jewelry box. If nothing else works, you will have to revert to an old save. Hlidara Mothril can be killed by the time you begin to pursue this quest. The good news is that her body has the keys to the castle, and the countess will give you enough of a hint to know that she does not wear the ring when she is sleeping. That's really all you will need to complete the quest, but you will miss out on hearing about the torture chamber and secret passage. The dialogue sequence can be mixed up enough so that it no longer makes much sense at all. When talking with Amusei in his prison cell, he asks for a lockpick. If you leave to go find one, you may speak to NPCs about the "Recovered Caro family ring," even though you have not finished the conversation with Amusei and found out that the ring belonged to the Caro family. When returning to Amusei to give him the lockpick, you may no longer have the option to give it to him and hear what he has to say. If the door to Amusei's cell is opened before handing him a lockpick, he will leave and sneak up to just behind the prison door. Despite being out of his cell, he will still insist on being given a lockpick in order to progress the quest. For some reason the Countess will not go to sleep if the Count is on the left side of the bed. You can try sneaking up behind her, however, once you get up to the chair she will detect you and fight you alerting all guards whilst doing so. The ring you're looking for may not be in the jewelry box. If you talk to the maid and then a guard and don't talk to Ahdarji before opening the box. If you first talk to Hlidara Mothril to find out about the countess taking off the ring at night, and then talk to Count Marius Caro who tells you to talk to Hlidara Mothril. Reportedly, if the countess is sleeping on the left hand side of the bed, this bug is likely to happen. Just wait outside the castle for a couple of days and try again. If the countess is on the right hand side of the bed, the bug will be fixed. One possible reason is that the countess usually sleeps on the right side of the bed (where her jewelry box is), and she would usually place her ring in the box before going to sleep. But if the count sleeps on the right side, she will have no choice but to sleep on the left side of the bed. Consequently, she will also forget to drop off her ring in the box. Use the console command player.additem 00035E95 1 to add the ring to your inventory and complete the quest. Otherwise, head outside the castle and wait for a couple of days or more, then go back in and the ring may appear in the jewelry box. You may need to try waiting multiple times, but it has been confirmed that this fix does eventually work. Another possible fix is to kill someone who belongs in the quest like the countess' bodyguard. You will get a journal update that you have to pay the blood price. Pay the price and you will automatically complete the quest, even if you had no rings, this also works with two rings. However, there have been reports that the option to pay the blood price may not show up in conversations with S'Krivva even after killing, for example, the countess' bodyguard. The countess' jewelry box can contain two identical copies of the quest ring. Immediately after you pick up the first ring, you will get a quest advancement telling you to deliver it to Ahdarji. As for the second ring, you must leave it behind. If you pick up both rings, Ahdarji's dialogue options will no longer include the "I found it, here you go" option, and you will be unable to complete the quest. This means no more Thieves' Guild missions. Also, both rings are quest items that cannot be dropped or sold, so you'd be stuck with them forever. Use the console command player.removeitem 00035E95 1 twice until the counter says 0.00, then player.additem 00035E95 1 to fix the problem. Occasionally, the ring will not be removed from your inventory at the completion of the quest. As it is marked as a quest item, it cannot be dropped or sold. Use the Console to remove the ring: type player.removeitem 00035E95. 5 Armand is no longer my primary Thieves Guild contact. My new contact is S'krivva, in the city of Bravil. I can find her either at home or at the Lonely Suitor Lodge. I should ask her if there are any commission jobs for me. 10 S'krivva has asked me to retrieve a ring that belongs to Ahdarji. She is a Khajiit living in Leyawiin. I need to go to Leyawiin and see if I can find her. 15 Ahdarji is offering 100 gold coins for her ring. The ring was stolen by Amusei. I wonder if that is the same Argonian that I competed against to get into the guild? I'll have to look around for him. 20 Amusei is in jail here in Leyawiin. The only way I'm going to find that ring is to talk to him there. 30 Amusei knows where the ring is, but he won't tell me unless I get him a lockpick. 40 Amusei told me that the ring was inscribed on the inside with the name Alessia Caro, a.k.a. the Countess of Leyawiin. Apparently he tried to sell it back to her. When he went to deliver the ring, he was arrested and thrown into jail. She kept the ring. It must be somewhere in the castle, assuming she isn't wearing it. I'll need to find someone who can tell exactly where. This might be a good time to revisit Ahdarji, or to see what the beggars know. 42 A beggar told me that Hlidara Mothril, Alessia Caro's chambermaid, might be able to tell me where she keeps her ring. I'll have to sweet talk her though. 45 Apparently Ahdarji can use the ring to read missives and other castle documents written by the Count. She sells the information to other Counts of Cyrodiil. Now that the cat is out of the bag, so to speak, she has upped the reward to 200 gold coins. 47 I got a tip to speak with Hlidara Mothril. If I sweet talk her, she might tell me more about Alessia Caro and the ring. 48 It seems there is a secret passage that leads from the basement to the countess' private chambers. If I can find it, that passage might be a safer way to sneak into her room. 50 It seems that Alessia Caro wears the ring all the time, which is going to make is really difficult to steal it from her. However, I learned that she always takes it off at night. I'll have to sneak into her bedroom at night and rifle through that jewelry box. 60 I've got the ring. Now to find Ahdarji and collect my reward. 69 S'krivva tells me that I must pay a blood price of 1000 gold coins for each person I killed while recovering Ahdarji's ring. Until I do, I am no longer a Thieves Guild member. 70 Ahdarji was very grateful and rewarded me nicely for the ring. I get the feeling she hates Argonians though. No wonder Amusei had trouble with her. Now all I have to do is report back to S'krivva in Bravil. 80 Finishes quest S'krivva thanked me for my devotion to duty within the Thieves Guild. I guess that mean [sic] Ahdarji told her I returned the ring. I've been promoted within the guild as well. 40 I have killed someone while trying to recover Ahdarji's ring. S'krivva is sure to find out and make me pay the blood price for it. I'll have to pay her to get back into the guild. 41 S'krivva tells me that I must pay a blood price of 1000 gold coins for each person I killed while recovering Ahdarji's ring. Until I do, I am no longer a Thieves Guild member. 45 Finishes quest I paid S'krivva the blood price for my killings. Recovering Ahdarji's ring cost me more than I earned. It is possible to use the console to advance through the quest by entering setstage TG04Mistake stage, where stage is the number of the stage you wish to complete. It is not possible to un-complete (i.e. go back) quest stages. See SetStage for more information. Esta página foi modificada pela última vez à(s) 21h12min de 31 de março de 2015.